It takes something pretty special to drag me into PlayStation Home these days. A free-to-play multiplayer space combat game complete with customizable ships and zero-G avatar exploration might just do the trick. Every day that passes without a new entry in the Wing Commander series is another day I desperately seek out any game involving spaceships shooting other spaceships. Games like Hellfire Games' Novus Prime, coming tomorrow to PlayStation Home. PlayStation Home's Central Plaza faces the threat of alien invasion, and it's up to your avatar to beam up to the new Novus Prime space station to join the battle and keep the virtual world safe for large groups of people doing the cabbage patch. Once on the station avatars can purchase and upgrade ships in the workshop before taking them out into outer space to do battle. 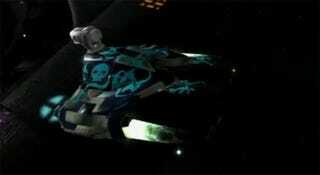 Avatars can also wander into the zero-G area, shooting parasitic aliens as they drill through the space station's hull. It looks like a real blast. Is Novus Prime enough to drag you back into PlayStation Home?